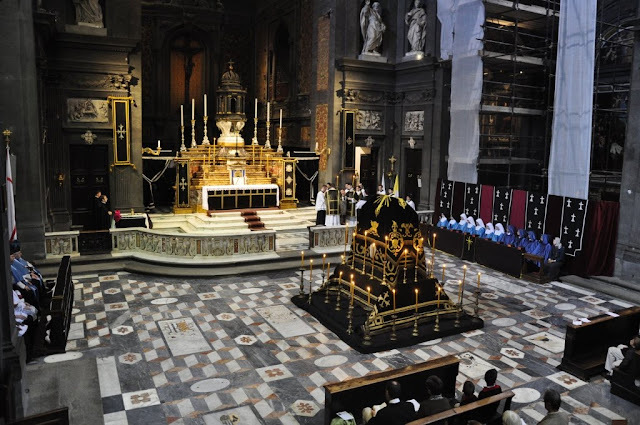 In the usus antiquior, the catafalque is used for the absolution of the dead when no human remains are present. 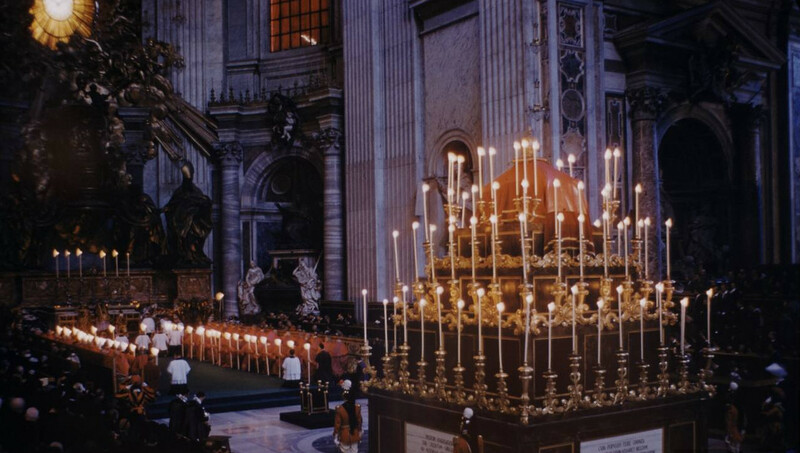 All Souls Day is one of the times of the liturgical year when it is seen and it has become an iconic aspect of the Roman rite. As we are in a period of recovery of these classical traditions, the question will sometimes be asked: "how is it to be constructed?" 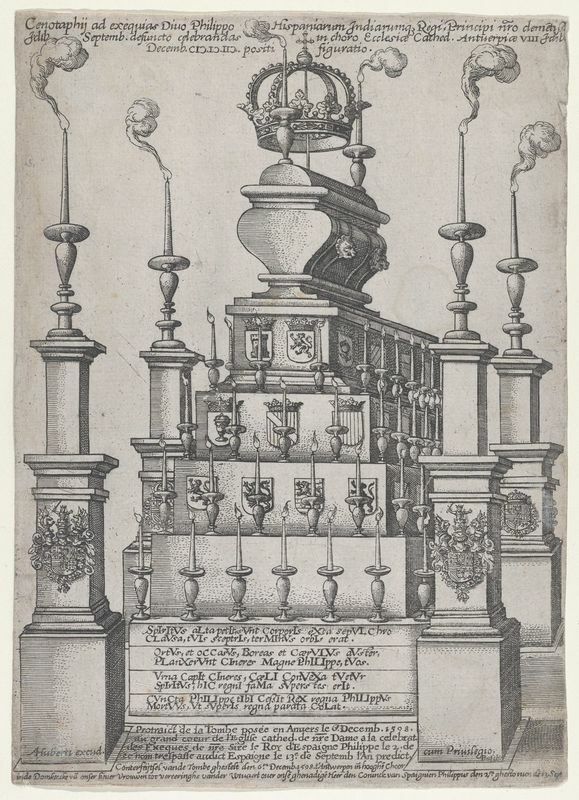 The catafalque then is simply constructed of a bier (a raised rectangular wooden box or metal stand of dimensions that would hold an adult sized coffin) which is then covered by the black pall, or the same, with a type of symbolic coffin further placed upon it, similarly covered. In addition, one typically sees four or six candles and candlesticks used around it (though no particular number seems proscribed and one will sometimes see many more used); these are set upon the ground. These candles are traditionally of unbleached beeswax and the candlesticks themselves will frequently be made of wood, often painted black, or sometimes metalwork silver in colour is used. Catafalque, derived from the Italian word catafalco, literally means a scaffold or elevation, but in its strictly liturgical sense the word is employed to designate the cenotaph-like erection which is used at the exequial offices of the Church, and takes the place of the bier whenever the remains are not present. It is covered with a black cloth or pall, on which there is a cross either of white or some other colour (De Herdt, Praxis Sac. Lit., II, 328). The catafalque is usually placed immediately outside the sanctuary, and is the centre of the ceremonies of that part of the exequial office known as the absolution, receiving the same attention as the corpse would if present. Hence it is that lights burn around the catafalque during the function, and it is aspersed with holy water and incensed... Formerly the word was used to designate the bier or structure on which the corpse rested. No flowers should be used in connection with it, but it is allowable in the case of deceased prelates to mount their insignia to show the dignity, and in the case of nobles to display the family coat of arms, together with coronets, orders, and other insignia, to show the rank of the deceased. 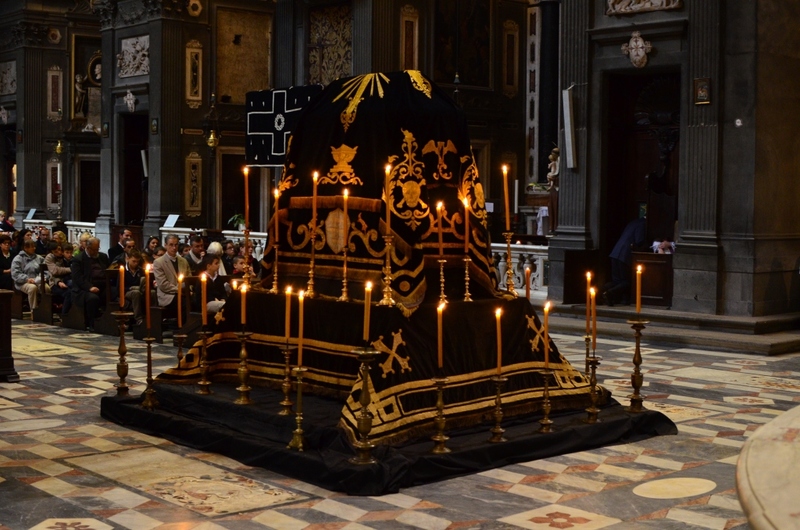 I should also note that a catafalque itself is not absolutely required; one may instead simply spread a black cloth or pall on the ground where the coffin or the catafalque would be. Evidently though, there is something to be said for the coffin-like symbolism of the catafalque. Here are some other examples of the catafalque.